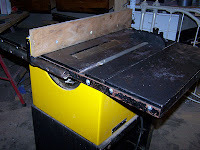 Last summer I picked up this 80's Rockwell 10" Homecraft table saw. I found it on craigslist for cheap so I brought it home. The table (steel, not iron) was heavily rusted and the gears and screws to adjust height and tilt were rusted solid. I figured "someday" I'd get around to fixing it up. Then early this year I traded my good Rockwell Contractor's saw (and other tools) for a car. Fixing this one moved up to the top of my priority list. The first photo is how it looked when I brought it home. It looks like someone spilled a drink on it and left it to rust. The first thing I did was clean and lubricate the screws and gears so the blade could be adjusted. It was easier than expected. I soaked them all in PB Blaster every day for a week, then started tapping on them with a hammer. They broke loose, and a brass wire wheel cleaned the rust up. I coated everything with grease and it all moves fairly well now. Not like a nice cabinet saw, but usable. 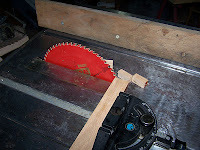 This saw isn't a direct drive, though the motor is a universal type inside the housing. Instead, there is a short belt between the motor and the arbor inside. Interesting design. It also uses the same arbor, nut, fence, etc, as my old contractor's saw! While I still had them both I swapped fences between them to see if they were truly interchangeable. They were. 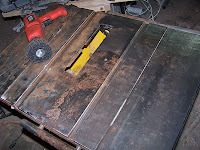 As I did with the Contractor's saw and jointer I de-rustified before, I used the nylon stripper wheels to remove the rust. 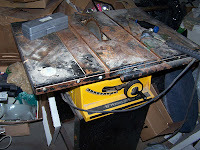 But first I hit the table top with a belt sander to knock off the worst of the rust bubbles. 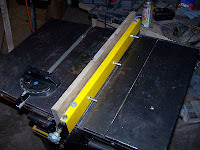 The stripper wheels took care of the rest, but MUCH more slowly than on the cast iron tops of my previous saw. 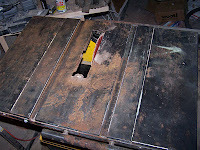 The steel top of this saw is harder and takes more effort to strip. In addition, the top was painted (or maybe powder coated... hard to tell the finish is so damaged), which left me with a decision. Do I leave any of the paint? Or take it to bare metal. After finding rust under some of the apparently good paint, I decided to take it all the way down. I briefly considered repainting it. There would be two benefits here. First, paint means I could fill the rust pitting with JBWeld or something and have a flat surface since the paint would hide the signs of fill. Second, it would look as it did when it left the factory. Neither benefit were enough to get me to paint it. I just needed a smooth surface to move wood along. It didn't have to be filled, but could be bumpy all it wanted as long as the wood moved well. 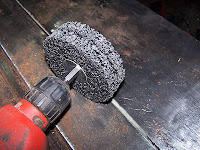 And no need for rust protection... After all, cast iron tables are unpainted. If I kept it waxed I should be good. Besides, I wasn't going for a full restoration. Just enough work to make it usable. I don't much care how it looks. In fact, I didn't bother de-rusting the mounting brackets for the wings. They'll be fine for many more years in my shop/garage. Perhaps I'd pay more attention to all the rust if I lived someplace humid. But here in Denver, no need. Low humidity, low temps, mean low rust. As long as I don't spill any drinks on it, that is. After several hours with the stripper wheels, the surface was smooth enough to work with. I put several coats of synthetic automotive wax on it the top and mounted up the un-restored fence and miter gauge. Everything works well and smoothly. I did some test cuts to make sure I wasn't being overly optimistic. The only 10" blade I had was a dull Freud Diablo. I really need to get that thing sharpened... But it worked for this test. I haven't yet adjusted the fence or gauge for accuracy, but the saw works great! Enough power to cut small oak, and a 2x6 chunk of pine. I'm happy enough with it. 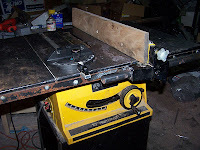 It's smoother than my contractor's saw was, but only because the c-saw had a dinged pulley on the arbor after the set screw worked loose and the pulley went flying. Still, it's very functional. And using sleds for critical cuts instead of trusting the steel surface will keep everything true and accurate. I recently got one just like it. Hope mine turns out as well as yours. And you answered some questions for me too.